No, this is not going to become a book review website. We will, however, encourage you to read books that will expand your awareness of water issues and their importance to our region and the health of our rivers and broader environment. The Promise of the Grand Canyon - John Wesley Powell's Perilous Journey and His Vision For The American West by John F. Ross. Highly engaging and certainly not a textbook. It tells the story of Powell's life with a special focus on his unprecedented journey down the Grand Canyon and his explorations and insightful thoughts on water and the west. Ross included the following quote from Powell's comments at a national irrigation congress in 1893. "When all the rivers are used, when all the creeks in the ravines, when all the brooks, when all the springs are used, when all the reservoirs along the streams are used, when all the canyon waters are taken up, when all the artesian waters are taken up, when all the wells are sunk or dug that can be dug in all this arid region, there is still not sufficient water to irrigate all the land." On October 4, the Forest Service hosted a meeting for a group of interested community members, fly fishers and environmentalists at the Winter Park Pub. Those attending learned about current efforts to restore Colorado’s native cutthroat trout. The presentation by U.S. Forest Service Fisheries Biologist Matt Fairchild followed by an opportunity to ask questions and socialize with other fish and river enthusiasts. The overall goal is to create a metapopulation of greenback cutthroat trout across approximately 37 miles of stream habitat and 106 acres of lake habitat in northcentral Colorado. To achieve this goal, 54 miles of connected streams will need to be treated to recover the 37 miles of greenback habitat. Implementation is starting this year in Grand County and restoration work will be phased over 15 years, including designing, enhancing or constructing two permanent and three temporary non-native fish barriers; removing non-native fish such and brook and brown trout that compete for food and habitat; and stocking native lineage fish, protecting the habitat until isolated native populations have established. Work is beginning with surveys and the construction of a fish barrier in Grand Ditch, and the application of piscicide in Parika Lake and Baker Gulch to remove non-native species. A portion of the work is being funded through a $1.25 million trust established following a negotiated settlement agreement between the U.S. Forest Service, National Park Service and Water Supply and Storage Company. Colorado Trout Unlimited is serving as the trustee. These projects will help create a stable, isolated population of Colorado’s threatened state fish – once thought to be extinct. If you think water's not going to continue to be an important issue in the west think again. A New York City based investment company is buying up agricultural water rights in western Colorado for investment purposes. Learn more about it on the Water Education Colorado website by clicking here. Support Sustainable Funding for Colorado's Fish and Wildlife! This week the Colorado Senate will be looking at HB 17-1321 – to authorize the Parks and Wildlife Commission to have the power to set its own fee rates instead of the Colorado Legislature. This action would enable them to increase fishing and hunting license fees, within specified limits, in order to provide needed funds to maintain fish and wildlife management and to meet growing demands for habitat conservation and for hunting and fishing access. Take action by contacting your state Senator and letthem know that you support increasing CPW funding, and that you believe CPW should retain authority to purchase land and water to benefit fish and wildlife. You can call your Senator directly to make sure your voice is heard – using your address, you can look up your Representative and their contact information. Talking points can be viewed here. Or you can quickly comment using our email template by clicking here. Colorado TU’s Board of Directors has voted to support HB 1321. Since 2009, CPW has been forced cut or defund fifty staff positions and sliced $40 million from the wildlife budget. Without new revenue, more painful cuts are inevitable. This bill gives the Parks and Wildlife Commission authority to set fees with a limited increase (rather than having the legislature set them), but within a cap set at a 50% increase from current levels. Importantly, it allows future license fees to be adjusted gradually over time to keep up with inflation rather than needing the legislature to approve larger increases every few years. The bill would also allow out-of-state fishing license fees for Colorado to be increased to bring Colorado’s pricing in line with peer states like Montana, Wyoming, and Utah. A senior fishing license (not more than half the regular price) would also be re-instituted. The bill also would add a new sticker and fee program for boats, to help finance inspections for aquatic nuisance species. You can read more about the bill here. Can the Market Solve Water Shortages? A February 9, 2015 article in Pro Publica discussedd allowing the economic marketplace determine how water is allocated. Low value, high water consumprion crops like cotton and alfalfa being grown in arid areas would have a hard time competing for water with cities or higher value agriculture. Would placing true financial value on water allow cities to develop while agriculture declined? What would this mean to the health of our rivers and larger environment? Why are some environmental groups interested in this possibility? Follow this link to the thought provoking article. What is oil and gas wastewater? Where does it come from and where does it go? For an excellent discussion about these and other related questions, click here. Politicians play politics, twist the facts, and tell half-truths, right? Apparently, some “river scientists” do too. Mr. Elliott’s letter of July 16, 2014 regarding the Moffat Project purports to present a scientist’s point of view, but it reads like a politician’s campaign, right down to unsupported accusations of “backroom dealings” and catchy sound bites that completely misrepresent the facts and the views of those who support a solution for the Moffat Project. Supporters of a solution, including the county, care deeply about the data. That is why they have invested millions of dollars to develop real data that documents stream conditions today so we can tell whether conditions in the future get better or worse. That is why they have reached an agreement (the Mitigation and Enhancement Coordination Plan or “MECP”) with Denver Water to continue to collect real data and do something to not only prevent deterioration, but improve current conditions. Significant amounts of water, money and other resources have been committed to protect and improve stream conditions as part of the MECP. Mr. Elliott omits mention of these benefits so he can make his point – (for a true list of MECP benefits, please go to http://www.coloradotu.org). 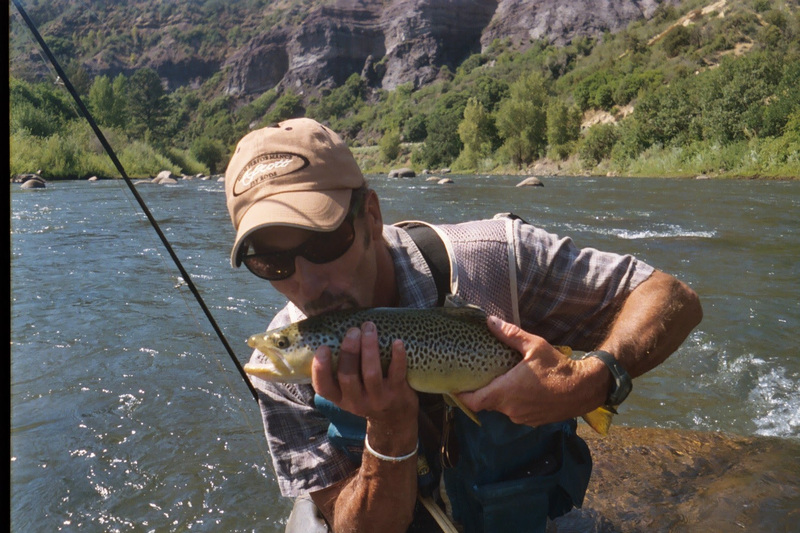 Mr. Elliott and his Front Range clients can continue to dedicate their resources to politics and to more technical “models” that generate consultant fees for Mr. Elliott but don’t get us any closer to a solution for the rivers. Those who support a solution will be here protecting and improving our streams long after Mr. Elliott and his Front Range clients move on to other projects. Please see the section below on the Moffat Tunnel Collection System Project for the highlights of the new agreement which contradict Mr Elliot's comments in his letter to the editor. MARCH 6, 2014: GOOD NEWS ABOUT THE FRASER RIVER!!! All our activism, letter writing, educational efforts, hard work and protest have finally paid off. This is the biggest (and best) news in a long, long time about the Fraser! TU has helped broker a deal with Denver Water and Grand County which will actually help to save the Fraser. Several of TU's key demands will be included in the new agreement. Foremost among these are a science-based approach to monitoring the health of the river and inclusion of "learning by doing" in the actual permit. We need to push hard to make sure our proposals are included in the final agreement. If you're ready to write your letters or emails to ensure our success, CLICK HERE for some help, addresses and guidance. · After years of dispute over Denver Water’s proposed Moffat Collection System Project (Moffat Project), Trout Unlimited, Grand County and Denver Water have reached an agreement on how to protect the Fraser River and its tributaries from the project’s impacts. · Denver Water currently diverts water from the Fraser and Williams Fork basins through an extensive network of tunnels and pipes that funnel water to the Moffat Tunnel for delivery and use in the Front Range. Water funneled through the Moffat Tunnel is stored in Gross Reservoir. It is estimated that over 60 percent of the native flows of the Fraser River are currently diverted through the Moffat Tunnel on an annual average basis. The proposed Moffat Project would triple the size of Gross Reservoir, allowing Denver Water to increase its diversions. · The Fraser River system supports valuable trout fisheries that attract thousands of anglers annually and help support the local economy. Trout Unlimited has fought for years, along-side Grand County, Fraser River land and business owners, and other partners, for measures to ensure that, if built, the project will not further degrade these valuable fisheries. Of primary concern to Trout Unlimited has been the potential for the project to worsen already high stream temperatures and to exacerbate existing sediment problems by reducing available peak flows. Above all, Trout Unlimited has been concerned that existing models cannot properly predict impacts in a stream system that is already so depleted, and TU has consistently called for a monitoring and adaptive management program capable of detecting and preventing unanticipated impacts. · Our efforts are paying off. In February of this year, Trout Unlimited, Denver Water and Grand County agreed to a package of measures that will not only address impacts from the proposed Moffat Project, but will also pave the way to improve existing stream conditions. · The measures, embodied in the Grand County Mitigation and Enhancement Coordination Plan (MECP), include both “mitigation” measures designed to address Moffat Project impacts identified in the US Army Corps of Engineers’ (Corps) final Environmental Impact Statement, and “enhancement” measures that Denver Water has voluntarily committed to undertake to improve existing conditions. A list of these measures is included below. · At the heart of the MECP is Learning by Doing (LBD), a monitoring and adaptive management program to be implemented by a committee that includes Grand County, Trout Unlimited, Denver Water, and Colorado Parks and Wildlife. The LBD Committee would implement an extensive monitoring program to assess stream health based on specific parameters including stream temperature, aquatic life, and riparian vegetation health. Water and financial resources committed by Denver Water (listed below) would be deployed to prevent declines and improve conditions where needed. Denver Water also commits to use flexibility in how it can operate its extensive water diversions system to help reduce impacts and where possible provide benefits to the streams. LBD would also be the vehicle through which mitigation measures imposed by the Corps would be implemented. · Given its importance, Denver Water will ask the Corps to include LBD in the 404 permit. If for any reason LBD ceases to function, the requested permit condition would commit Denver Water to implementing the MECP through an alternative mechanism approved by the Corps. It should be noted that inclusion of this “fail-safe” permit condition is critical to the agreement. Without it, Trout Unlimited cannot support either the MECP or the Moffat Project. · Trout Unlimited has fought hard to protect the Fraser River basin streams. The MECP not only provides the tools needed to protect and even improve stream conditions, but it also puts Trout Unlimited in a position to influence their future. Denver Water commits to implement both mitigation and enhancement measures through LBD. If LBD ceases to function, Denver Water commits to implement these measures through an alternative process to be approved by the Corps. Denver Water has asked to include these commitments as a term and condition of its 404 permit. Not all news about our rivers is bad. Read the May 2013 article from TU about some progress by clicking here. Scientific American April, 2013: Can The World Afford Cheap Water"First, tear out your lawn,” suggested climate modeler Mark Cane of the Lamont-Doherty Earth Observatory. For the full Scientific American article about the cost, value and importance of Water, click here. Unfortunately, recent studies point to many dam bypasses, fish ladders, etc. as unsuccessful in allowing fish to travel around dams. Here's a link to an article in the February 2013 Scientific American. For more recent news about our rivers, please see the News page. An excellent article appeared in the Denver Post on 4/11/12. On February 17, the Denver Post ran a front page article about the damage to our watersheds likely to result from additional trans-basin water diversions. The EPA has requested additional review of the Moffat and Windy Gap proposals. Please read the article and follow up with letters phone calls and emails to Governor Hickenloper, the EPA your elected representatives, your friends on the Front Range and anybody else willing to listen! For more news, please see the NEWS tab on this web site. To see a brief TV newscast focusing on two Grand County water issues, click here. You'll see a good summary of the Moffat agreement and the latest on the Byers Peak project's water. During March and April 2014, we did have some truly good news about progress on the Moffat Firming Project agreement. Unfortunately, it doesn't change the fact that Grand County has more water diverted from it than any other county in the state. As much as 80% of the upper Colorado will be sent to the opposite side of the continental divide. The Colorado River Headwaters Chapter of Trout Unlimited has partnered with Grand County TV18 to create a new TV documentary series, much of which is being filmed here in Grand County. The series will highlight the challenges facing our rivers, inform you as to what can be done and how you can help protect our natural heritage. The show airs daily at 12:30 PM and can be seen via a live stream (click here for the live stream) everywhere, and in Grand County on Comcast channel 18. For details, including how you can support the documentary, click here. Colorado Public Radio produced a new series on the connection between fracking and water. To listen or read about the connection, click here. Click here for an informative 18 Minute podcast on how the rainbow trout took over the world.